Over 100 years after the founding of the Caney Creek Community Center, educators are still arriving on Caney Creek from all over the world to fulfill Mrs. Lloyd’s mission to educate the leaders of the Appalachian region. One such professor is Dr. Sigrid Greene, whose career and commitment to education has taken her across the globe, from Europe to Pippa Passes. 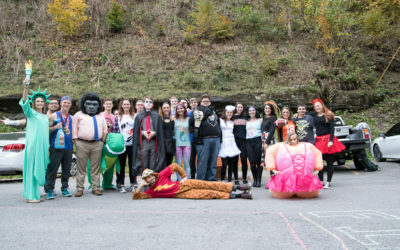 Alice Lloyd College students, along with their various campus organizations, brought an abundance of smiles to hundreds of area children this Halloween as they hosted the ninth annual “Trunk-or-Treat” across campus. Emily Burgin is a junior from Lee County, Virginia, majoring in Accounting and Business Management with plans of attending Law School upon graduation. Like many Alice Lloyd College students, she came from a financially challenged background, yet this rough start has not and will not limit her aspirations. Like many Kentuckians, basketball for the ALC Eagles Men’s Coach, JR Hammond, is not just a sport – it is a way of life. In the midst of every rebound retrieved, every shot blocked, and every play called, Coach Hammond finds the epitome of what he sees as the keys to a successful life. On September 18th, Alice Lloyd College held a dedication ceremony for the naming of the Joseph W. Craft III School of Business and Appalachian Leadership. Joe Craft, President and CEO of Alliance Resources Partners LP, attended and spoke to the students, faculty, and staff on his Appalachian upbringing and his personal insights into achieving success in life. On September 11th, Alice Lloyd College held the Opening Convocation for the 2018 fall semester. U.S. News and World Report’s 2019 Edition of Best Colleges ranked Alice Lloyd College among the top colleges in the nation! Dr. Cindy Salmons first set foot on the Purpose Road in 1994 as an English major and has devoted her life to the mission of Alice Lloyd College ever since. Appalachian education is a cause that is very near and dear to her heart. Alice Lloyd College is consistently ranked as one of the top private colleges in the South. Now, College Consensus, a unique new college review aggregator, has recognized Alice Lloyd College among the top five highest-ranked colleges and universities in the Best Colleges and Universities in Kentucky for 2018. On Saturday, August 25th, the Alice Lloyd College Lady Eagles volleyball team under the guidance of Coach Nathan Hall, opened the new season by hosting a tri-match at home against Hiwassee (TN) and Boyce College (KY).